Chris Black's Blog | Cut the Drama. Flash is Here to Stay. Cut the Drama. Flash is Here to Stay. I really wish that Steve Jobs would quit misinforming the public. It amazes me that Apple and Adobe’s childish feud is even news worthy. I’ve had a number of people tell me that I should start looking for a new profession because HTML5 is the future and Flash is dead (link). All of them iPhone users and each of them were just tech savvy enough not to know what the hell they were talking about. Here is ten minutes worth of research to show Steve Jobs’ opinion on the matter is a bit more like a leap of blind faith. 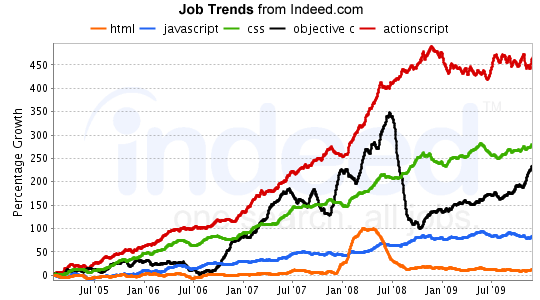 Well, even through a recession, ActionScript job growth has held strong. Objective C on the other hand looks very unstable. Nobody seems to be able to make up their mind about how much to pay Objective C programmers. Is it worth more than HTML or not? Would you work in a development language that had the potential for a 50% pay cut if you lost your job? 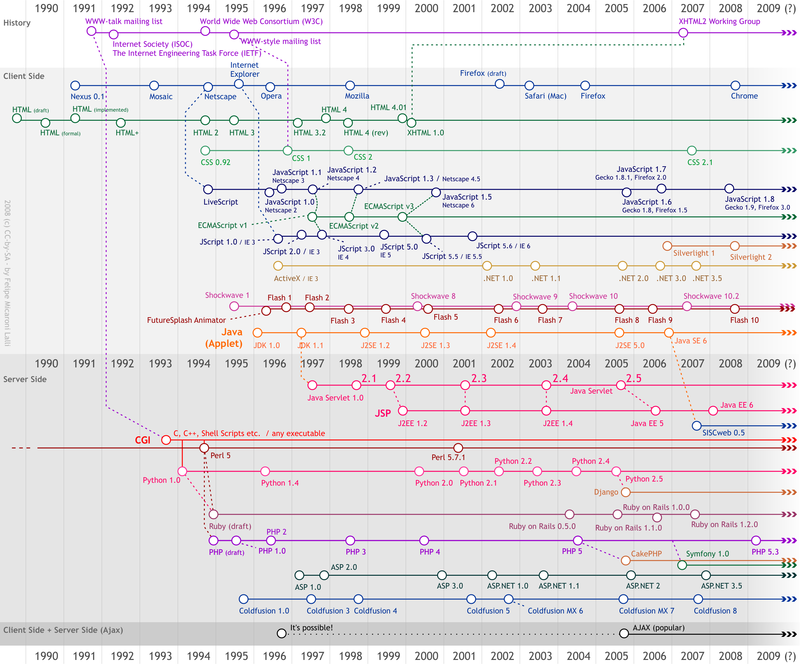 I would like someone to point out the web development language that died. Anyone? Oh wait… none of them have ever died! When somebody comes out with something better, the competition does the same. Not to mention that it took AJAX nearly ten years to catch on. As much as some people hate PHP, it is still around. As much as some people hate Microsoft, .NET is still kicking. As much as Steve Jobs hates Adobe, Flash is here to stay. Do I hate HTML5 and think it will fail? No. I hope it succeeds. The reason I code ActionScript is because it is widely supported and cutting edge. HTML4 wasn’t enough for me. When HTML5 has a 3D engine, physics support, frameworks, blogs of examples, full browser support, and a great IDE, I’ll strongly consider it. Until then, please don’t tell me I should look for a new profession. Perl seems to be holding strong. I wish the data went back further, was there ever a significant decline? They still have a pretty big market for jobs with a steady incline. Coldfusion jobs have not gone up but have also not really gone down over the past 5 years. That’s pretty good job security for ‘dead’ languages. 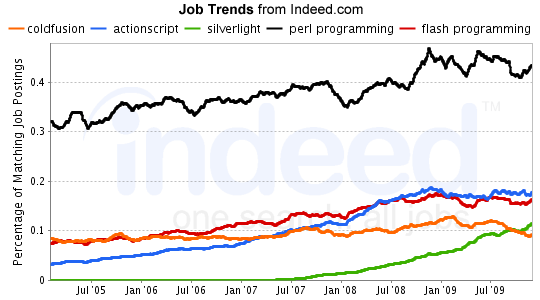 Looks like Silverlight has seen nothing but positive growth over the past few years. Was it two years ago Microsoft and .NET developers where predicting the death of Flash due to Silverlight? Looks like there is enough market for both. 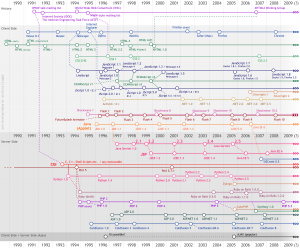 If the web wants interactive maybe there is room for Flash, HTML5, and Silverlight to all grow over the next 5 years. Based on the data at hand, that would be my prediction. Yep, I also had people extremely “worried” because Flash will be obsolete in less than an year and I will have no work. Specially because I resigned from my full time job 3 months ago to work exclusively in Flex/Flash. HTML 5 seems for people (specially the ones who have no idea what they are talking about) to be the big new thing and everything else is dead. I don’t want to go back to the dark ages of making the same work 10 times to be sure something works similar in all browsers and then every time there’s an update in any browser, here we go again. More important, clients will not want a 500% higher budget thanks to this, disregarding how hip the HTML5 buzz word is now. To name just one web development language that is practically dead: Perl. Another: ColdFusion. Yes, both are still deployed on a lot of places around the world, but they have the mind share and practical relevancy of COBOL. This is subjective of course, but Flash devs are doing the worst thing they could be doing right now. Reacting reflexively with self-serving one sided commentary. Yes, my opening paragraph was a self-serving, one-sided commentary that was a reaction to the Wired post. I did, however, follow up with real statistical data. If you would prefer to dis-agree with the historical data that is fine by me. Everyone is due to their opinion. I dislike how BOTH sides will argue until the end of time about a topic based on opinions. You can argue PHP vs. .NET until the end of days. Are either of them going to be out jobs in five years? Doubtful. I’m not attempting to argue whether Flash is better than HTML5. Just that Flash isn’t going anywhere. When the job market data shows otherwise, I will be the first to post it. For now, let’s put down the pitch forks and accept reality. I agree with you that Flash is not dead and it won’t be dead. While the HTML5 world does continue to advance, Adobe will continue to advance the capabilities of Flash Player and will continue being the bleeding edge of interactive web content. Regardless, I’m excited to see what the HTML5 crew is up to. I love some me some Google Docs, and I’m not sure that a Flash implementation would have been as good. On the flip side, I’m fairly certain that Aviary tools would be *awful* in HTML5. I think there will be a place for both technologies in the future, working side by side to advance the web experience. Similar to how OS X and Windows keep pushing each other as well. HTML5 will no doubt win the video war eventually, but that won’t put flash debs out of a job. JS may win the animation side at some point but that’s about it for the forseeable future and is still limited. I also agree with you, Flash is not and will not be dead for a really long time, if ever. It certainly has it’s strengths as well as its weaknesses. My bigest problem with Flash is video, it really scares me that one Comercial company has such a strangle hold with ~ 90% of video on the internet being served with Flash. I’m very happy to see large sites like Youtube and Vimeo trying out HTML5 for video. No special plug in required (just a modern browser). flash isn’t going anywhere fast agreed, maybe the whole web 2.0 buzz word was getting old and the anti flash / html 5 bandwagon is the latest craze. I really don’t get the whole excitement over html 5 video, the vast majority of users have a hard enough time installing and even understanding what flash player is yet alone going through the process of upgrading their browser. Its only going to be widely adopted as people upgrade their systems with new OS’s installed with more current browsers in them. The thing I love about flash development atm is the best cross platform experience. HTML 5 will never have that for years and years ++, especially backwards compatibility or the current market penetration of the flash player today. I just hope things get better for mac and iphone os users, sooner rather than later.